A friend, family member, or someone you might know in school, your neighborhood, church, or synagogue has been diagnosed with Asperger's, Autism, ADD, ADHD, or PDD. A great way to make understanding easy for young children. I requested this book in exchange for my honest review to share with my 6 year old granddaughter Bella. My neighbor has a daughter around the same age with Asperger's. The two girls hit it off instantly and now they are inseparable. Bella does get confused about her friend's behavior sometimes. This book is right on her level. I highly recommend this book for teachers K - 2nd grade because of the short length its perfect to share in class. 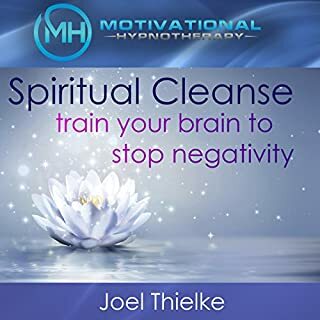 I enjoyed this short audiobook as it is a gentle reminder to us not to judge the book by its cover. It is a very easy book to listen to which makes this book a great gift to young children. I can see this book in any kindergarten or elementary school as an aid for teaching acceptance and understanding of one another. 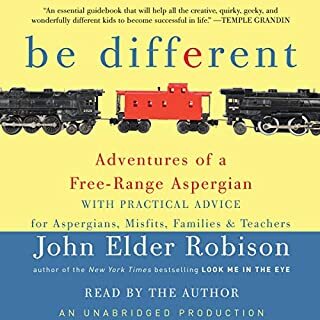 I also think that a parent of a &quot;different&quot; child should get tons of copies of this audiobook and gift it to children around her child. Thank you, Claudia Barrett for bringing people closer together! &quot;Someone You Might Know&quot; is an eye-opening and heart-tugging glimpse inside the mind of someone dealing with autism, Asperger's, ADD, ADHD, PDD, etc. Everyone feels different sometimes, even those of us who are supposedly not different. Author Claudia Retif Barrett's main point near the end of the story was that we all feel a little different from time to time and that's no reason to be rejected or to reject someone else. The story helps the listener find compassion for someone (as Billy Joel said in the song Only the Good Die Young) who might be laughing a bit too loud, but that never hurt no one. I enjoyed this book a lot. And for those who criticized the narrator -- did they really miss the entire point of the book? Wasn't it clear that the narrator was saying some of the words DIFFERENTLY? Sheesh, talk about needing to hit you on the head with a brick. The very first word of the book, Preface which should have been pronounced /prefəs/ was pronounced pre-face as in /pri/fās/ and I thought, how funny that she said that word so DIFFERENTLY. And later I reflected that the book is about being different. An amazing book for kids and adults alike. Worth a listen for kids who may be prone to bullying or who just might be afraid to be friends with the kid who talks too loud, or even the redhead or Asian child because they are different. Don't let your kid be that kid who is a jerk to the different kid. Play them this great book. 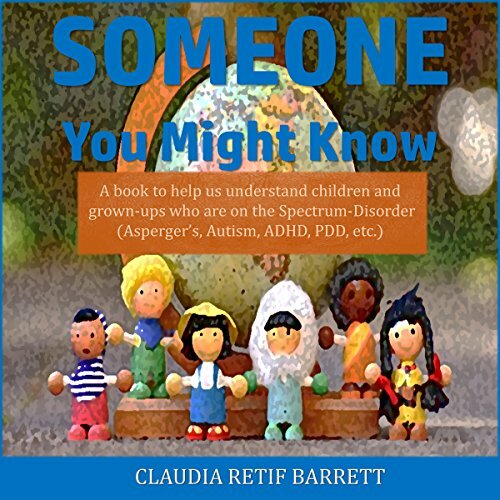 Someone You Might Know: A book to help us understand children and grown-ups who are dealing with Autism, Asperger's, ADD, ADHD, PDD, etc. By Claudia Redid Barrett was a good quick read. It is a helpful guide to learn what people with these conditions go through. Perfect for sharing with kids and school groups! Someone You Might Know is a quick little presentation in which the author shares recognizable circumstances in which the odd child at school or around the neighborhood might have a spectrum disorder that would explain their behavior and that everyone should treat them kindly and not single them out. This is always an important message and this audio presentation is just right to get this simple message out! Short encouragement to have understanding and be kind. Charming little illustration that might encourage a young person to be more understanding and patient with his or her peers who exhibit behaviors that may class them on the spectrum somewhere. 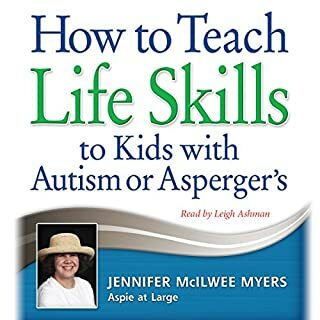 You wouldn't even necessarily have to believe that all that is called autism today is actually a real diagnosis of anything for this book to engender understanding and kindness to those different from you. 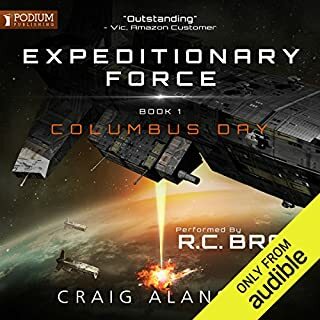 I enjoyed the narrator and the descriptions. 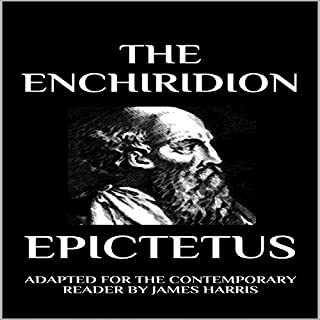 A fun little audiobooks that I wish I would have been willing to heed when I was a youth. This was a simple way to help you understand people that struggle in the spectrum. Sometimes we forget the struggles others face. Glad I listened. You will like it too. I received this free copy audiobook at my request and have voluntarily left this review. This was a short book about understanding people who are on the spectrum disorder. It was good, but it became less about understanding and more instructions on helping. Using the figure of Mary, we are told to become friends with her because she might become famous. While this is qualified that Mary might not become famous, it feels really weird that I'm being told to become friends with somebody because they might become famous. That isn't the foundation of a stable friendship because you're just going to want something from them. 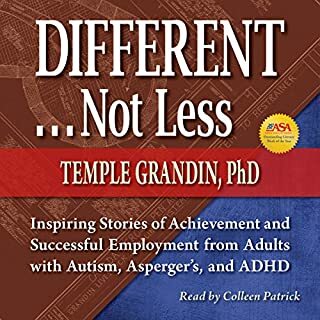 It also felt quite uniform; due to the short length (only eleven or twelve minutes) it feels like the author places people who have autism, ADHD, Aspergers, ADD, PDD (which I have never heard of before) into one category and then says make friends with them because they struggle. In real life, it's just not that simple. What was one of the most memorable moments of Someone You Might Know? Did Rebecca Maria do a good job differentiating all the characters? How? Nothing moving just a nice story to remind everyone how nice everyone should treat each other no matter how different they are. Also just because someone doesn't appear to be affected you never know what they do when they are by themselves.